Nearly $350 million in payroll between the New York Yankees and the cross town, Mets. The result? No October baseball in the city of New York. No Johan, no A-Rod, no Jeter, and no David Wright. The Yanks aren't headed to the postseason for the first time in 13 years and for the second consecutive season the New York Mets played themselves out of the playoffs in the final month. While the farewell send offs to beloved Yankee Stadium, and that ugly step-child known to as Shea, were fixtures of 2008, the opening of each franchises new stadium will certainly be an early season storyline. 1. I'm not "fire everybody, clean house" guy. 90% of the time, firing people leads to confusion in the organization and rarely does it solve internal problems. However, I do think the majority of the Mets struggles result from the moves their general manager HAS & HASN'T made. GM, Omar Minaya, is responsible for the Mets acquisition of then 34-year old, Pedro Martinez. In just four seasons with the Mets, Pedro has started in only 79 games winning 32 of those contests. In 2008, while earning $11.8 million, Martinez went 5-6 in twenty starts with an ERA close to 5.70. But we wondered why Red Sox GM Theo Epstein wouldn't give Pedro the years, clearly it wasn't the dollars. Going into the 2008 campaign and coming off of one of the clubs most historic September letdowns, the Mets GM did very little to improve their bullpen. With closer Billy Wagner entering his 13th season, turning 37, the Mets had no insurance policy. After Wagner was forced to shut it down for the year before September, the Mets pen had already started to struggle. A team that is expected to win the National League pennant cannot enter the season with no insurance on an aging closer. Questions Minaya should have been asking himself. 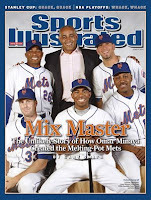 Lastly, at the 2008 trading deadline, in the midst of a pennant race, the New York Mets and Omar Minaya added no one of significance. While the Brewers added ace C.C. Sabathia, the Cubs added frontline starter Rich Harden, even in their own division, Philly added A's starter Joe Blanton. Mets fans, ask yourselves this. Should Omar Minaya be held accountable? 2.One of the biggest problems with the Mets, that I see, is their inability to judge talent and what happens when talent comes together. In short, the Mets throw a bunch of pieces against the wall and hope some stick. Their order is poorly put together and has way to many holes. 3B, David Wright, and SS, Jose Reyes, are the only Mets who are hitting over .300 or close to, while playoff teams, Boston, Philly, and L.A. have at least five in that neighborhood. Offensively, once you get past the bats of Delgado, Beltran, and Wright, the dropoff of run production is to large. Maybe I'm thinking with an American League East brain, but the Mets need a philosophy change. On base guys, besides Jose Reyes, building a lineup that can produce top to bottom, and corner outfielders like Ryan Braun, Pat Burrell, and Matt Holliday. The days of counting on half-outfielders like Church, Alou, Endy Chavez need to be over. 3. I've debated this one for a while. Signing big-name free agents like, Carlos Delgado, Pedro Martinez, Johan Santana (trade & re-up), and Carlos Beltran, hasn't actually done much for the Mets. While all are all-stars, or potential all-stars, they've managed to achieve two of the worst September collapses in the franchises history and balloon a payroll to $138 million dollars. 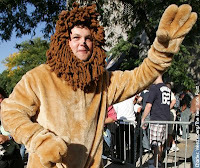 I preface you with that because I endorse the signing of free agent to be, Francisco Rodriguez. (along with other bullpen moves). Rodriguez is by far the best relief pitcher to become available. He is only 26 years old and will be 27 by the time he takes the hill for the Mets. Rodriguez has a career era of 2.35 and has saved over 40 games in each of the last 4 years, including his record setting 62 in his contract year. Aside from that, Rodriguez would be making a move to the National League, based on the performance of Sabathia and Harden in the second half of the season, after their switches to the NL, Rodriguez would be filthy. Given the Mets have lost Wagner for all of 2009 already, they need to make this move and lock up a closer. Rodriguez is that guy. 1. Sell the team to an ownership group with brains. Half kidding. On a more serious note . . No disrespect, but the organization that has won 26 World Championships shouldn't have the likes of Sidney Ponson in their September starting rotation. Close to a $210 million dollar payroll is in three words, out of control. Unfortunately for this team, you aren't allowed roster overhauls. You can't have three to five poor years which would result in giving the farm a refresher, you can't put aging stars like Posada on the market and expect much in return. With that said, you've got to go out and spend, but spend wisely. With the status of both Andy Pettitte and Mike Mussina remaining uncertain, the Yanks have to prepare for life after the two are gone. With Pettitte (36) and Mussina (40) aging, even if they both return what can the Yankes expect? The goal? Get YOUNGER! They will have Wang (28) coming off injury, whatever you can get from the Hughes (22)/Kennedy(24) faction, and after that, your kind of broke. I'll say they keep Pettitte. Major dollars off the book for Giambi and Abreau allows the Yanks to throw alot of money, not Zito like years and dollars, at C.C. Sabathia. Hard looks at bullpen guys like Brian Fuentes could give flexibility and a definitive role for the kid Joba Chamberlain. I like Chamberlain in the pen, but the Yanks can't afford to take another flyer on starting pitching. Your 2009 rotation could and should look like this: Wang, Sabathia, Pettitte, Chamberlain, and Hughes. Find journeymen projects and waiver guys like the Sox did with Colon and Byrd in 2008. This way you have insurance on your starters, while I love Chamberlain taking the place of Mariano and I think Chamberlain, like Pap and K-Rod, has the mentality to close, I don't know if his arm can hold up in the pen, and he did well when he started. Rotation, Patched. 2. Trade Robinson Cano for prospects to filter into your minor league system. The Yankees don't have position players in the minors that are ready to make an impact on the big league club. While the Red Sox, their rivals, have brought up talents like Kevin Youkilis, Dustin Pedroia, and Jacoby Ellsbury, the Yanks have yet to do that. Cano is a far cry from the guy who hit .342 in 2006. Each of the last two years as the Yankee second baseman's at bats went up, his average dropped off. In '06 Cano had 482 AB's while hitting .342, in '07 Cano had 617 AB's and hit .306, and in '08 he had 597 AB's and hit just .271, like I said, a far cry from 2006. At 26 years old he still has value to a team looking to make a splash in the National League, Arizona, cross town Mets, maybe even Milwaukee. Offense was never the Yanks biggest problem, not even close. Trading Cano doesn't change much and they could get young minor league talent that will take the place of some of their aging stars in the years to come. I'm not sold on Cano, I don't think Girardi is sold on Cano, and neither are Yankee fans. Cano out, young talent IN! 3. The Yankees need a Jim Edmonds. I'm not talking about the center fielder for the Cubs, but they need someone of his make up. Edmonds risks his body to make a play, he hits the cover off the ball, and has always been like that. Jeter is the captain, the leader, and what young players look up to, that's not what I'm talking about. The New York Yankees need to get back players LIKE Paul O'Neil, everyday balls-to-the-wall players who produce! A-Rod is great, but he isn't clutch and no one marvels at his "tough play," I already explained what Jeter is to the Yanks, and Posada is too old at this point in his career. What guys like Bill Mueller was to the Red Sox championship run in 2004. What David Eckstein was to the Angels in their championship season. The Yankees need, THAT GUY. I'm unsure of his contract situation but White Sox outfielder, Nick Swisher is. These are the types of guys that win you championships, these are the types of guys that come through in clutch situations. Can you name one player on the Yanks who is that guy? It isn't Damon, it isn't Cano, and it isn't the Melk Man. Find a Jim Edmonds, and win in Septemeber/October. Two Chicago teams in the post season, two L.A. teams in the post season, wait, do we really want two New York Teams in? Either way, the Red Sox are still the favorite going into 2009, have yourself some of that!